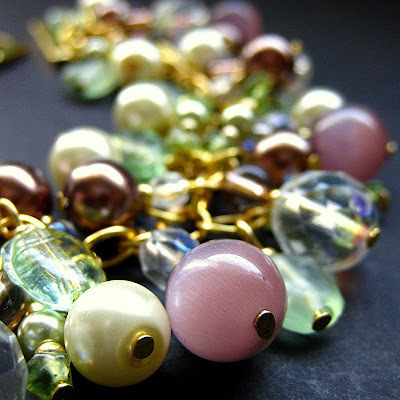 The warmth of peridot and gold combine with shades of purple, cream and deep burgundy in a beautiful, one-of-a-kind beaded cluster bracelet of glass beads, gemstones and pearls. I love working with peridot, and I love wearing it too. When I started this bracelet, I was watching the movie "Under the Tuscan Sun" and I think it probably had a lot of influence on the theme and colors that were brought together into the finished piece. This bracelet is a beauty to behold and no amount of pictures could ever do it justice. Made with genuine peridot stones and glass pearl beads, it's both luxurious and unique and is designed to be the perfect accent whether you want to dress up a casual outfit or create a focal accent on an elegant ensemble. I personally love cluster bracelets. The sound that they make when worn is both cheerful and soothing to the senses. Bracelet is 8" (20.3 cm) in length including clasp.